Stunning... love the colour, and the perfect bokeh in the light points in the distant background. Beautiful image. really great photo! love the lighting! I can't think of anything more to say, so I'll just sit here and look at it for a while. Aww jeez....... now I don't even know how to start attempting to replicate this. Freakin' genius. I cannot believe I've never seen this. Holy cow! Simply AWESOME. I just love your stile man! with every photo of yours i look at you make me see things i have seen before in a totally new way. That is a gift my friend.. keep it up i love your work! what an incredible capture, did you ask it to pose? 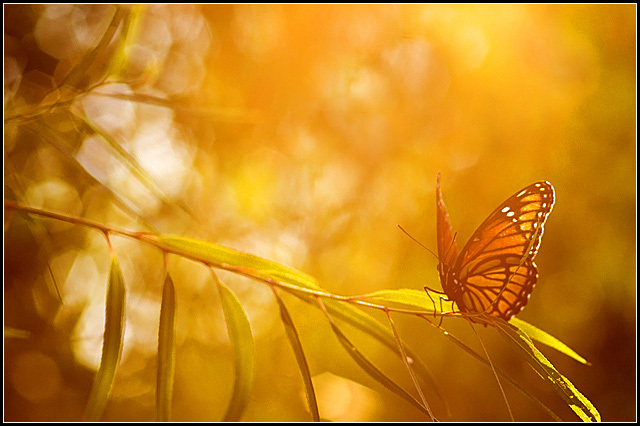 The golden light of this is so incredible, the butterfly is perfect. This is my favorite of the ones you posted. It is a truly beautiful shot. Going in my favorites. I swear when I am excited, sorry. Proudly hosted by Sargasso Networks. Current Server Time: 04/21/2019 04:08:45 PM EDT.